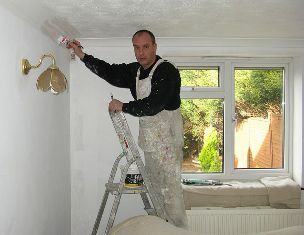 Want to make a little extra cash painting houses this summer? Thanks to Michigan’s licensing apparatus, it’ll cost you. Michigan law requires painting contractors to pay $235, take 60 hours of state-approved prelicensure education, pass two exams and be over 18 years of age, according to the Institute for Justice, a libertarian public interest law firm. Michigan is one of only 10 states that licenses painters — and only five states require any education to paint for a living. Lisa Knepper, director of strategic research at the Institute for Justice, worked on the firm’s recent report on licensing in all 50 states. She says that occupational licensing has "rapidly become a burden" on middle-class citizens across the nation. "We looked at 102 occupations affecting low or middle-income workers. What we found is that these licensing burdens are not only widespread, but irrational," she said. "[States force] workers [to] spend a lot of time getting licensed rather than working." Michigan requires licensing in a variety of areas not commonly done in other states. Floor sanding and finishing contractors, those who "scrape and sand wooden floors to smooth surfaces using floor scraper and floor sanding machines," are required to pay $215, take 60 hours of state-approved education, pass an exam and be over 18 years of age. Michigan is one of only nine states who require licensing for floor sanders, and only five states require any extra education to perform this task. If citizens want to install security alarms, the state requires $200, over 1,400 hours of training, an exam and a minimum age of 25, according to the Institute for Justice. Sixteen states require no license for security alarm installers. Glaziers, those who install glass, are licensed in only nine states. Michigan requires a license, $215, 12 days of experience and an exam. Only four states require any extra education to perform this task, the Institute found. Belinda Wright, a licensing manager with the Department of Licensing and Regulatory Affairs for the State of Michigan, said that painters who receive more than $600 for a project need to be approved by the state. “The law says that residential builders and residential alteration contractors (painters) require a license,” she said. Occupational licensing proponents often point to the requirements for safety reasons. But Kneppler said it is unlikely that this licensing has made Michigan a less dangerous place to work and live. The state Office of Regulator Reinvention has recently suggested 18 occupations that should be deregulated. One industry, barbers, are required to spend 2,000 hours in training — more than lawyers in Michigan. House Bill 5326 submitted to the Michigan legislature by Rep. Ray Franz would exempt individuals and contractors from a variety of licensing mandates, including painting. It currently sits in committees for the State House and Senate.